The MultiPower series serves as the central power source of G&D devices that require an external power pack (12V - for example DVI-CPU or DVI-Extender-F). The MultiPower series, you can operate and supply 12V (max. 600mA) up to 12 different devices - depends on the variant. Connect the device you want to operate to one of the available Mini-DIN4 sockets.. The MultiPower series serves as the central power source of G&D devices that require an external power pack (12V - for example DVI-CPU or DVI-Extender-F). 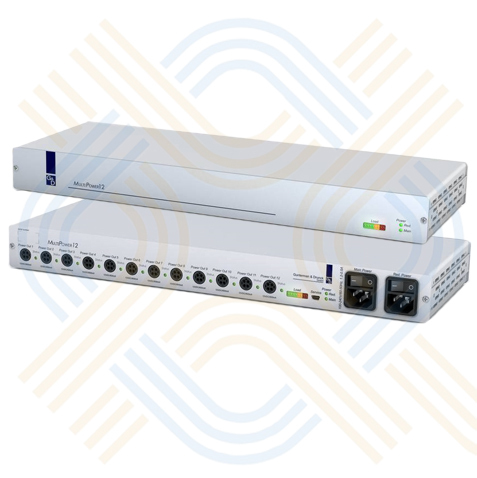 With the MultiPower series, you can operate and supply 12V (max. 600mA) up to 12 different devices - depends on the variant. Connect the device you want to operate to one of the available Mini-DIN4 sockets. The MultiPower receives power from one or two IEC plugs.